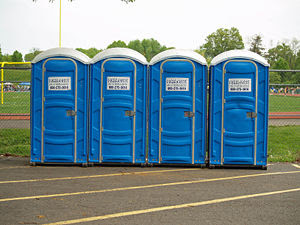 Despite the conventional wisdom, stealing a port-a-john is probably a bad idea. I faced this common dilemma - to steal a port-a-john or not - yesterday when I realized there was one parked outside of my home. I don't steal. In fact, I am not sure if ever have stolen anything. But it is such a rare occasion to have a port-a-potty parked outside one's home that I thought perhaps stealing it was relevant. I enjoy entertaining - having guests over and promoting what Caucasians refer to as "food, folks and fun." I have a small backyard and patio, and I believe it would be convenient to have an outdoor facility, perhaps a port-a-potty. Here's the problem, though: I am completely uninterested in figuring out how I would clean the port-a-john. Presumably, I would call some number, and others would clean it. But shouldn't these things be cleaned daily? ... Ew, icky! No thanks, port-a-john. You're simply not for me. I hope you understand why.